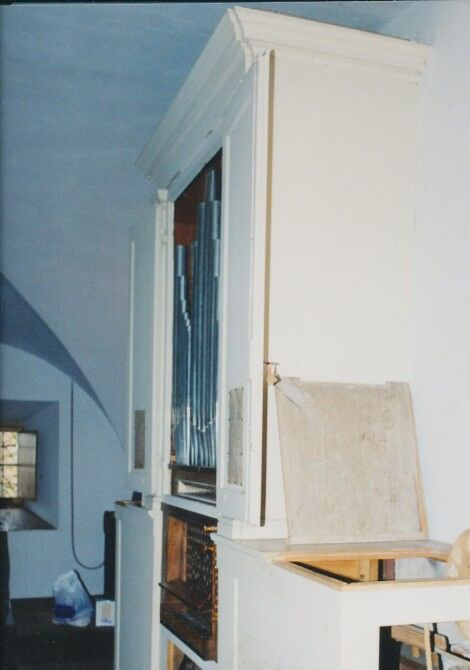 In February 2002 we were given the opportunity to examine an Italian organ in detail, in the course of a repair instigated by Christopher Stembridge, who was at the time organizing courses based at the monastery. We also spent time with our expert guide and performer, visiting 16th century organs at the Duomo and Badia in Arezzo, Le Grazie at Montepulciano, S. Maria Nouva, S. Filippo and S Chiara in Cortona, and the Annunziata in Florence. Although most Italian classical organs are by northern standards small, with a single manual and no more than 10 stops, we started to grasp their range and subtlety. By the end of the week, other organs started to seem gross and extravagant by comparison. We also realised how conservative the Italian tradition was by our standards, with mid-19th century organs only slightly larger, but made in identical, or very similar, fashion as the earlier ones. That was certainly true of ‘our’ organ, made by Paoli in about 1830. There are extra solo stops (three treble flutes, two half stop reeds, drum and carillon), the short octave (usual in earlier organs) has been filled in, the stop action uses sliders, not a spring chest, but the soundboard is made of a solid piece of wood, the rollers are metal stapled to the board, the keys are pivoted at the tail, the two multi-fold wedge bellows are operated with ropes. The organ is made and laid out in much the same way as previous organs. Interestingly the short toe pedals were laid out with a short octave and the extra accidentals added at the side, as of for a second octave. An identical toe pedal for Bb operated the drum. The organ is basically in good condition, and almost entirely unaltered. We cleaned all the pipes, setting most of them in good order. The reeds worked well once they had been cleaned out, apart from three where the solder seams of the tinned plate resonators had sprung apart. The rest of the organ was cleaned and a few minor adjustments made. Accessible surfaces were treated with woodworm fluid. A broken bellows rope was replaced. The organ was checked for major voicing irregularities (eg overblowing, instability of speech, obtrusive quietness or loudness) and tuned after checking in octaves, etc. building up the ripieno like a mixture, since the addition of stops has an effect on the pressure. By a stroke of good fortune, the organ was ready for demonstrating to the nuns on the Friday, which happened to be the patronal day of the local saint, Santa Margherita of Cortona, who spent a few years at the beginning of the 14th century at the convent. That morning there had been a service attended by the Bishop at the Basilica at the top of the hill, where S. Margherita lies in a glazed casket, and a fair in the courtyard. After Christopher’s recital, the delighted nuns treated us to caramelised nuts, sparkling wine and Vinsanto. For Christopher Stembridge, the reward lay in having a teaching and playing organ within the walls of the convent where the summer course takes place (since the course, which he runs with his wife Ella Sevskaya, last year featured mainly other keyboard instruments). The course must be a memorable experience (details from stembridge@quilisma.com ), with a scholarly and enthusiastic guide for whom the music of this country seems to have become second nature, in delightful surroundings at the top of one of the hilliest of Tuscan hill towns. His dream is to see Cortona’s other organs restored, from the late 16th century organ in the perfect centrally-planned Renaissance church of S. Maria Nuova, to the early 17th century organ in S. Filippo. Unfortunately, one or two are beyond restoration. The organ stands on the second gallery. It and the gallery below are fitted with pierced railings so that the nuns were not visible to the lay people below. The nuns had their own choir at the east end, at the same level as the organ gallery, with an altar against the west wall. The windows at this level were also covered with grills.